Only when your Bosch microwave in your Watauga, North Richland Hills, Colleyville, or Dallas-Fort Worth area home has stopped heating properly, or stopped working in general, will you realize how much you take it for granted. 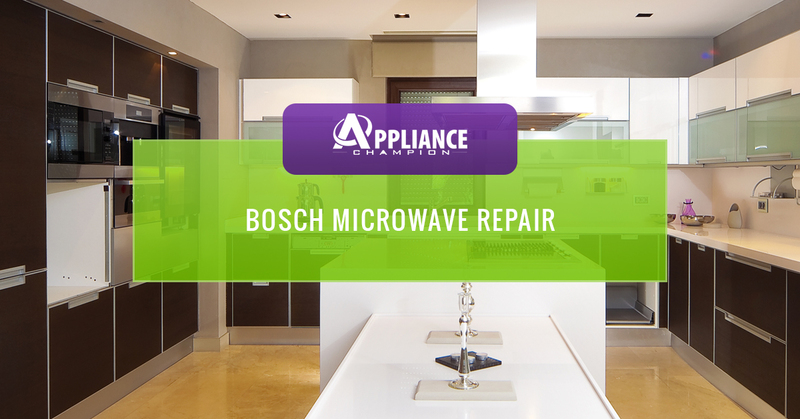 Luckily, Bosch microwaves don’t need a lot of repairs since they are generally reliable. However, all appliances will eventually not be able to perform like they used to. When that time comes, it’s best to call your Bosch microwave repair professional to take a look at it. Bosch microwaves use high voltages to operate. Even when you have the microwave unplugged to repair it, all it takes is a simple mistake to create a dangerous situation that will also ruin your appliance. In order to keep you and your family safe, rely on a local Bosch microwave repair professional to get the job done so your microwave is back up and running with your manufacturer’s warranty intact. We know how important your microwave is to your daily routine. That’s why our Bosch microwave repair specialists will come to your home in North Richland Hills, Colleyville, or Dallas-Fort Worth area and repair it as soon as possible. At Appliance Champion, we’re here to get your appliances back in working order. Appliance Champion is your Dallas-Fort Worth area appliance repair specialist. When you call us, you can expect to receive a microwave repair appointment as soon as possible with an appliance repair specialist who is factory-certified and customer-satisfaction focused. We do our best to not only provide you with a service that will maintain your Bosch microwave’s warranty, but one that can help you maintain your appliance so it continues to function at its best for years to come. Schedule with Appliance Champion—your trusted microwave repair specialist! and beyond in the Dallas-Fort Worth area! Knowing what to do with a microwave that’s on the fritz can be difficult. If you have questions, the best place to look for answers is our frequently asked questions, and our blog is a helpful resource. However, for more specific questions about your Bosch microwave, contact us! We are always happy to help.